Big Ben in London - The world's most famous bell tower. Big Ben is rising in the middle of downtown - next to the English Channel, the River Thames. It is the name of the clock in the tower at the Houses of Parliament. 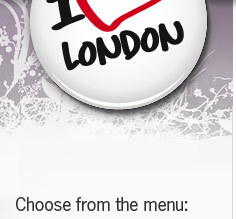 Probably one of London's most famous attraction. The clock is not open to the public. Big Ben is rising 96.3 meters into the air. 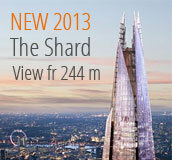 The first 61 meters is the bell tower, rising above a mighty scepter. 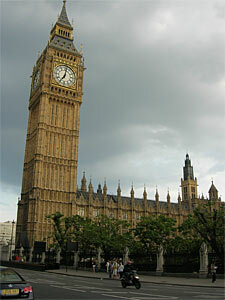 Big Ben is made up of four clocks due to that the tower is squared. The bell tower was completed in 1858. The bell tower was designed by Augustus Pugin and the clock is made by the clock maker Edward John Dent, but he died and didn´t get it ready. His stepson Frederick Rippon Dent completed its work in 1854. Big Ben has ticked since 7 Sep 1859 and in 2009 Big Ben celebrated 150 years. 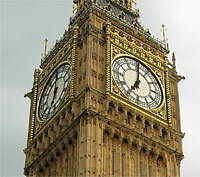 Big Ben is known for "keeping the time". The clock mechanism makes it known to always go right. Even during World War II when the Germans bombed London Big Ben ticked on.... It was not until 1962 during a snowstorm on New Year's Eve the clock began to slow down. This caused the stroke of midnight arrive 10 minutes late. The clock has actually stopped a few times: August 5, 1976 and did not start until May 9, 1977. It also stopped April 30, 1997 and May 27, 2005 (probably due to the warm weather which had lasted a long time). Opposite Big Ben and Westminster is a small park. Here we filmed a little so you can see how it looks. Klick on the play button under the movie or in the screen to start the movie. Big Ben has a little brother who is also in London, near Victoria Station. It is the 6 feet high, Little Ben. Little Ben is at the intersection of Vauxhall Bridge Road & Victoria Street. It was placed here the first time in 1892, was removed in 1964 and came back in 1981. Big Ben strikes in the New Year Big Ben is of course in focus on New Year's Eve. Radio and television broadcast the stroke of midnight all over the country to welcome the New Year. The clock actually strikes 13 times on New Year's Eve. Another major festival is the 11/11 - it is a day of remembrance for the army and civilians during times of war but also for the end of World War I. Big Ben's bells will sound at 11:00 AM followed by two minutes of silence. O God, keep safe our Queen Victoria I. The tower has been in many films, among others: The Thirty Nine Steps (1978), the animated film The Great Mouse Detective (1986) and science fiction, The March Attack (1996) and who hasn´t seen the movie National Lampoon's European Vacation (1985) with Chevy Chase getting stuck in the roundabout just below Big Ben.